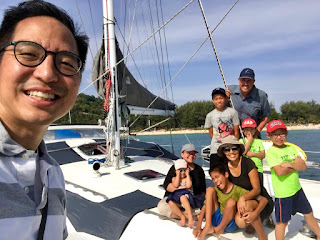 s/v Perry: We are family! Unfortunately, the day they arrived, Matt had to go into the hospital to have a kidney stone removed. Even hearing about this makes people wince and silently vow to start drinking more water. Originally we had planned to move Perry around to Patong Beach, but didn't have time because of the procedure. So I drove down to Patong Beach with Conrad and Mark (I do not recommend that your first driving experience in Phuket be in Patong Beach--picture driving on the wrong side of the road with motorbikes swarming around you in the crowds like those in Ft. Lauderdale during Spring Break). We had a nice dinner with Joe, Joyce, Abraham, Noah and Jochabette. Meanwhile, Matt had the procedure and shivered for several hours in the air-conditioned recovery room waiting for feeling and movement to come back into his legs after the spinal block (whilst not having eaten for the entire day and wearing a too-small gown that opened in the back). When he finally managed, with Herculean effort, to slightly move one toe, they decided they hadn't in fact severed his spinal cord and moved him back to his room. This was around midnight. The procedure was scheduled for 5 p.m. but was delayed in part because the doctor had some trouble locating the stone in the previous patient. I picked Matt up from the hospital the next day and we got to spend the day with Joe, Joyce and their kids. They visited the boat and we spent some time at their hotel, which has several nice pools. It was a nice change for Mark and Conrad, who have been loving the waves at Nai Harn Beach but having a hard time with the jellyfish stings they have been enduring. My brother and his family left the following day for their next stop. We were left with good memories and scrumptious treats from Jordan (including olive oil (newly pressed), figs, dates, baklava, and even Doritos and spicy Cheetos). We will leave for Langkawi soon because even though the winds are not favorable, our visas say it's time to leave. Before we go, we will need to clean the hard barnacles (as opposed to the gooseneck barnacles we have been seeing in the Pacific and Indonesia) off the boat bottom and propellers. We have never had so many barnacles grow so quickly. They come off the Coppercoat fairly easily but the entire surface is covered with the creatures. They have even been working their way up the intake and outflow hoses for the heads (aka toilets) and causing clogging (no, it's not just all those Middle-eastern figs and dates we've been devouring). What s nice treat to be all together with your brother and family. Also, after seeing the traffic in Phuket, you are very brave Jennifer to drive in it.